Have you ever heard words that just hit you all day and resonated with you so much that you couldn’t stop thinking about it? I heard the bible version Matthew 5:15 “put your light on a candlestick, not under a bushel” “Let your light shine”. Being a part of this 31 days of writing really feared me as my blog and my writing had its consequences a couple of years ago. But what I have learned this past year is, my words do nothing in isolation! Connection is about writing no matter who see’s you, be who you are, do what makes you shine! I love writing, and this past year – not writing for months and months really did create a big hole and void in my heart. I let fear win, and then I realized not only was I creating a void in me, but I was also disconnecting with my readers; those who do get something from my writing. Not only did I write for others by connection, but I also wrote as a part of my healing Journey. A couple of years ago I would write in my blog every night and share those writings in therapy with my therapist and that really created a sense of healing for me. It let all the words be put out into the room to be heard and something about sharing that with my therapist in the room just him and I, it was a beautiful thing, and I have missed that this year. I miss what it does for me. So when I heard the bible verse today, I thought about my blog “let the words shine, let others see your words and connect with them as well” … there is something about those words that just bring me out into the light and out from the dark these fears have instilled in me. It feels good to be writing day 7 … a week now I have been writing and I have to admit, the connection feels familiar – a good familiar. 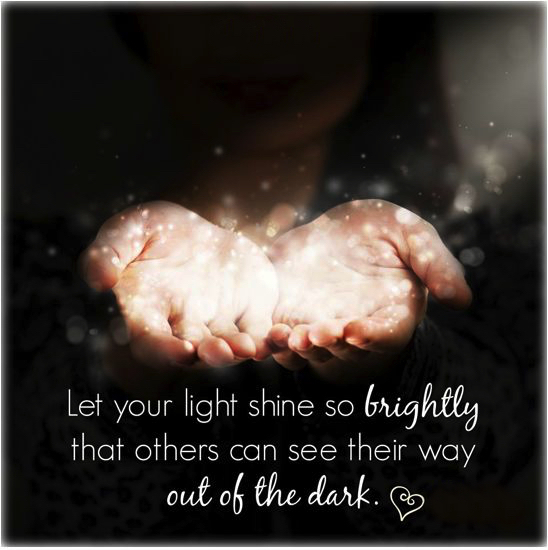 Don’t let anyone dim your light out of fear … let your light shine so others can find their way out of the dark. Love this post and the idea behind it!! So glad that you are sharing. Karen, I love that last sentence: “Don’t let anyone dim your light out of fear … let your light shine so others can find their way out of the dark.” So true! So, I admire your persistently writing your feelings, your heart, what you need out of the dark so you CAN shine…and in doing so, you will be helping so many others!! Thank you for sharing your heart, Karen…I will be with you on the journey! THANK YOU so much Barbara … you make my heart smile .. always nice to know you are on this journey with me … you take your time out of your busy day to read my blog and that means a lot to me …. BIG HUGS to you my friend! Keep on writing! It is so worth it, girl. Your light is shining brigh.